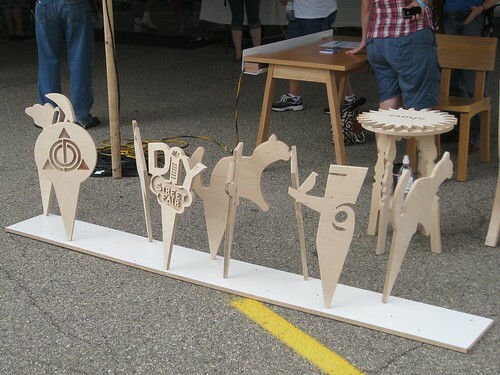 Maker Faire Detroit was a blast! It was held at The Henry Ford, which is a museum worth visiting in its own right. It is an amazing place we didn’t get to see nearly enough of and would love to go back and visit again. 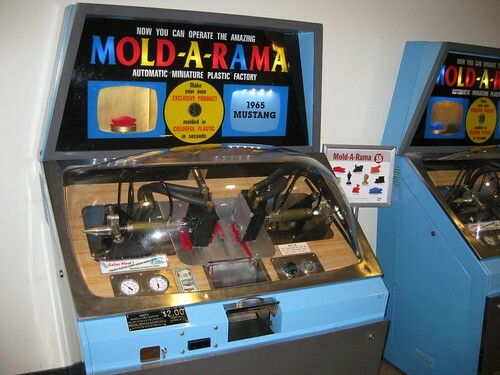 In addition to providing a history of American manufacturing and a showcase of amazing vehicles, they have Mold-A-Rama machines! 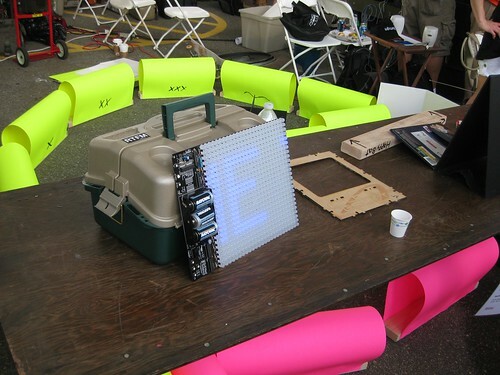 As usual, one of the most exciting things about Maker Faire for us was meeting and talking with other makers. 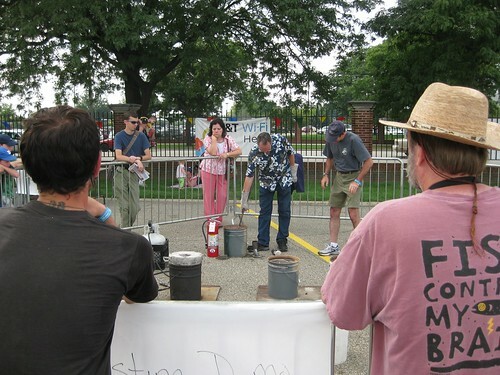 We got to talk to the participants in an aluminum casting demonstration, who were using foam that was carved onsite with a CNC router. We also really enjoyed our neighbors at the faire with the Note Grinder, a machine that read player piano rolls optically and used door lock actuators to press the keys on a synth keyboard. We were impressed with how pleasant it was to listen to (even for two days straight!) especially with the rhythm accompaniment provided by the actuator motors. The fine folks at Context Furniture were passionate about the renaissance of craftsmanship in Detroit and had great stories of reclaimed buildings. 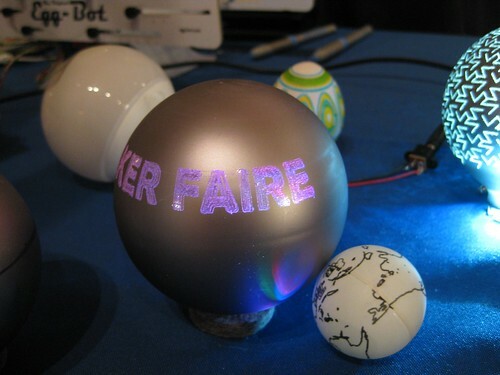 We were tickled to see several Evil Mad Science kits integrated into Maker Faire projects: a Peggy 2 being used as a readerboard, Wes and Don‘s 3D POV display with a Peggy 2LE, and Matt Mets’ Meggy Jr Sr.
Our Eggbots performed like champs, and we even tried out engraving on glass holiday ornaments during the faire. The engraver scratched away the paint on the surface, and as you can see in the top picture, they were beautiful when lit from within by an LED. We didn’t come close to seeing everything, but we’ve put pictures of some of what we saw in a set on flickr. 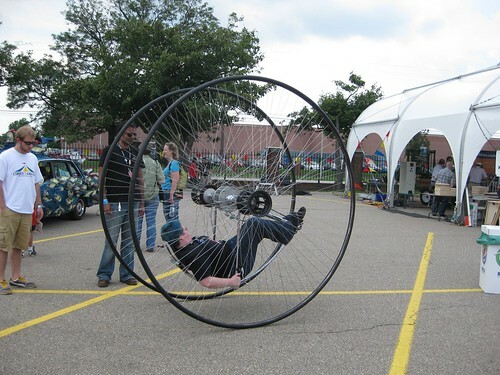 We hope to see you at Maker Faire New York! 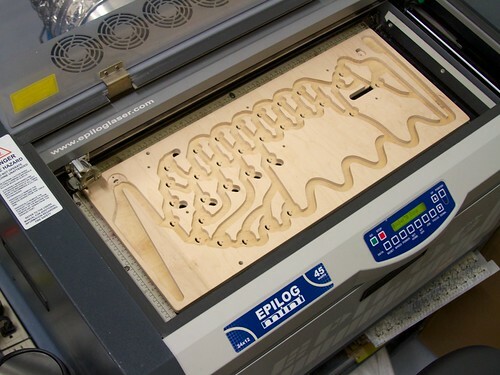 This entry was posted in CNC, Education, Eggbot, EMSL Projects, Engineering, Field Trips and tagged cnc router, eggbot, makerfaire, peggy 2. Bookmark the Permalink.